This week we read about a disagreement onboard The Cygnet. Mr Kingston had agreed that the passengers could help the first mate with the sails as he prepared to draw anchorage under the Sugar Loaf Mountain at Rio. All was well until Mr Kingston got annoyed with the first mate and ordered all of the passengers back below the deck. This week we will take a closer look at what life is like for the passengers who are travelling below the decks. How do they sleep, eat, learn, work, play and go to the toilet. 1. What is the accommodation for passengers like onboard our ships? 2. Where and how are every day tasks such as washing, eating, sleeping and toileting performed onboard? 3. How do the living arrangements of the crew and passengers compare? 4. Are all passengers treated equally? Examine the class structure in England in 1836. How did life for the wealthy upper classes compare to the experiences of poorer people? Find out how men and women were treated in England in 1836. What were the similarities and differences in the rights and responsibilities of each gender? How does this compare to life in Australia today? Explore the reasons why passengers chose to migrate to South Australia in 1836. In what ways did these reasons depend on a person’s gender or social status? Look at terms such as class structure, working class, middle class, aristocracy, upper class, labourers, servants, peasants, gentry, lower class, and nouveau rich. How do these terms apply to life in England in 1836? What types of words do we use to describe socio-economic status now? What does the term Victorian England mean? What period of time does this term refer to and why? Historical Questions and research Develop inquiry questions to find out what life was like for people of different social classes in England in 1836. Analysis and use of sources Examine artefacts from Victorian England. What do these artefacts tells you about life for different types of people in England at this time? Perspectives and interpretations Read back over the journal entries over the past few weeks. How does social class impact on life onboard for our passengers? Explanation and communication Design a ‘day in the life’ journal for a passenger onboard one of our ships. Consider how the passenger’s gender and social class will affect the activities in their day. 1. Most passenger ships from this time had three different levels of accommodation for passengers. Poop Deck – These cabins were located under the raised deck at the stern of the ship and were referred to as first class or saloon cabins. They were light and airy with comfortable beds. These cabins were used by wealthy, upper class passengers, the captain, the first officer and the surgeon. Intermediate- This level of accommodation was referred to as second class. It was located either on the same deck as the cabin passengers but with much less space or between the decks in the stern of the ship. 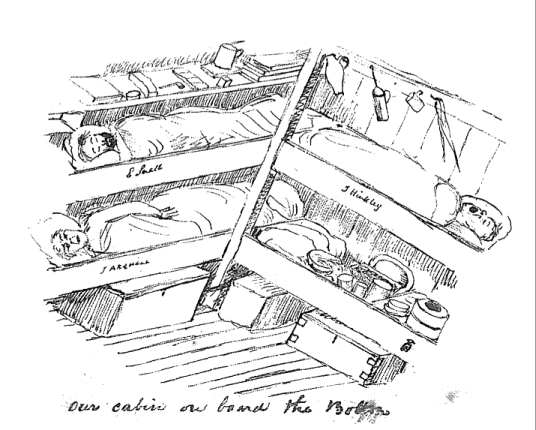 Between Decks- This accommodations was also referred to as steerage or third class. It was dormitory style accommodation with up to 48 passengers sharing each section. The quarters for single men and single women were separated by the married quarters. Design and build a diorama comparing each type of accommodation onboard. Include signage or captions to show who is allowed to travel in each cabin. Choose one of these bed measurements and make out the area on the floor with chalk or masking tape. Imagine what it would feel like to be sleeping in a bed this size, below the top deck in a cabin with more than 40 other people. How does this bed compare in size to your bed at home? 3. All food onboard was cooked in a separate galley on the deck. The captain employed a cook who worked with help from a few passengers. Steerage passengers had to prepare their own food in their cabins. Each cabin elected a ‘mess captain’ who carried prepared food to the galley to be cooked. The mess captain was also responsible for making sure passengers received a fair share of the food. What qualities do you think would be essential for a mess captain to have? Hold a class lunch. Elect a class mess captain, a ship’s cook and some galley hands and make sure all passengers help prepare the meal. Brainstorm a list of problems the mess captain may encounter and give possible solutions. E.g. food getting cold on the way down to steerage cabins, greedy passengers, slippery decks. 5. Imagine travelling for long hours below the deck in steerage accommodation. How do you think passengers would have passed the time and entertained themselves? Find out about games that children would have played in 1836. Which of these games would be suitable for playing onboard a ship? Work in a small group and try out some of these games. Teach another group the game you have played. 6. Many passengers onboard, especially those travelling in steerage were illiterate. Do some research to find out the reasons for this. If there were large numbers of children onboard literate passengers often formed classes to teach basic reading, writing and arithmetic. Imagine learning while you were at sea. Try completing a writing or drawing task with a can of soup or cardboard roll under your book. How well can you complete the task while your ship rolls over the waves? 7. Our ships had very few facilities for washing or going to the toilet but most did have a water closet (toilet) installed. The water closets usually consisted of a chute that went straight out to sea or were flushed with sea water by a manually operated pump. The steerage passengers were rostered on to pump the toilet. The water closet was only used by women and children. Men had to lean on the heads on the lee side of the ship. Find out what the terms heads and lee side mean on a ship. Do you think these facilities could be improved? Draw a plan of a steerage cabin with improved toilet facilities. 8. Access to the water closet was not the only difference in how male and female passengers were treated. Men were permitted to engage in physical exercise and social interactions on the upper deck whereas women were expected to remain in steerage most of the time. Women were not permitted to act as mess captains and were generally expected to take greater responsibility for food preparation. Consider what life onboard was like for both men and women. Use a Venn diagram to compare the experiences of men and women. What is your opinion on the similarities and differences represented by your diagram? Most of the accounts of life onboard ships of this era are written by captains and first class passengers even though these people made up a very small percentage of those onboard. Most passengers onboard were not literate enough to write diaries or record their experiences. What if everyone had been able to write about the voyages? How would our knowledge of life onboard have been different? All passengers should have been treated equally onboard regardless of gender or class. Next week we’ll look at the signals and flags. What do they all mean and how are they used to communicate on our ships.